Ambitious projects take time and when they involve something as complex as the sharing of intellectual property rights (IPRs) on lucrative medicines one is prepared for the long haul. But sometimes, when there is political will, things can move pretty fast. Two years after it was set up, a patent pool to make AIDS medicines more accessible to the world’s poor took off recently. The US National Institutes of Health announced it was sharing patents with the Medicines Patent Pool. It was the first to join the patent pool. The pool is a bold initiative to increase access to treatment by reducing the price of existing anti-retrovirals or ARVs (drugs used to treat HIV/AIDS patients) by creating a pool of patents and intelligence on such medicines donated by drug manufacturers. It was set up in July 2008 by the global health financing mechanism UNITAID, which is also hoping to stimulate the production of newer first- and second-line drugs. It hopes to do this by increasing the number of generic producers. In June this year, Ellen ‘t Hoen, UNITAID’s senior adviser on IPR and medicines, had announced that a mechanism had been put in place for “seriously negotiating with the drug companies” for licences. In an interview to Intellectual Property Watch, the online journal on IPR issues, ‘t Hoen disclosed that the UNITAID Board had decided the organisation would enter into a Memorandum of Understanding with a new Medicines Patent Pool Foundation and provide US $4.4 million for its first year of operations. ‘t Hoen, who was earlier with the humanitarian organisation Medecins Sans Frontieres, which has been in the forefront of the battle against HIV/AIDS in poor countries, describes UNITAID as “a laboratory for new initiatives and new thinking”. 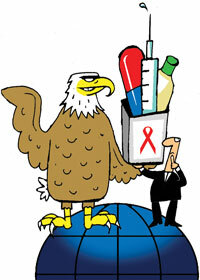 But health workers in developing countries are sceptical whether big pharma companies will join such a radical project. No one was expecting any patent owner to join the pool quickly and, given the surprised reaction, certainly not from the US. That the US public health system has become the first to join the IPR-sharing project, which would allow generic drug companies to make inexpensive versions of existing HIV drugs in exchange for a fair royalty payment, may prove a catalyst. On September 30, the White House announced that the US National Institutes of Health (NIH) had signed an agreement to share its IPR by providing a royalty-free licence for patents on darunavir, which is used to treat drug-resistant HIV-infections. It was discovered in 1998 by a scientist working at the National Cancer Institute of NIH and released in 2006 in the US and European markets. This second-line drug against AIDS is out of the reach of patients in most developing countries— except in India, where an inexpensive generic version made by Cipla is available at a fourth of the cost of the drug produced by Tibotec Pharma, part of US major Johnson & Johnson. It sells for around Rs 115,000 per patient per year against Rs 420, 000 charged by the originator company. Last year the Indian Patent Office had rejected the patent application for darunavir, saying it was a variation of an earlier drug and was, therefore, an attempt to “evergreen” or prolong the patent period of a medication by tweaking the process. Here lies the rub with the patent pool: are public laboratories that initially discovered the molecule willing to part with all the relevant patents or just variations of it, health activists want to know. Such concerns are shared by civil society groups like the National Working Group on Patent Laws, the Centre for Trade and Development (Centad) in Delhi and lawyers fighting suits filed by patient associations. For the moment, though, there is general celebration over NIH’s offering. James Love, director of Knowledge Ecology, which campaigns for access to medicines, describes it as a welcome political statement—that the Obama Adm inistration recognises the importance of a competitive supply of lowcost generic medicines. But he too concedes there is much more NIH can do, and much more other patent owners can do. “This is the beginning of a campaign to obtain licences voluntarily. The alternatives to the success of voluntary measures are confronting the challenges of obtaining non-voluntary licences, or shrinking the number of persons who will receive treatment. I think everyone recognises the stakes are very high,” says Love. The licence to the Medicines Patent Pool stipulates that the technology will be available for the benefit of all low- and middle-income countries. India, though, is wondering whether the pool will be deep enough to make a significant contribution to such aims.